Release notes for the October 2017 "Pony Rustler" update to Qmora. Mark a load as a "pre-load"
In working towards a pre-load management feature, we've added the ability to make a load as a pre-load, and which yard the pre-load is coming from. This is especially critical in calculating a driver's schedule as pre-loads remove an entire leg from a load. We're super excited about this feature! The application can now use all the information from the assign group's loads and build a time-schedule for the driver's day. You can now re-order any of the loads inside the assign group to help hone the schedule. Through this, we can also provide an estimated start-time for that assign group to ensure that first day's load is on-time. Additionally, we're able to estimate the time the driver will return to the yard and their hours of service for that day. 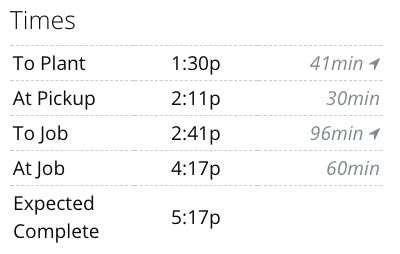 As the day progresses and loads are completed, the schedule adjusts to the actual times to help give you an accurate picture of the driver's day. We've corrected some errors that surfaced in September and the application continues to get faster and more reliable to use. As always, please reach out if you run into any issues!